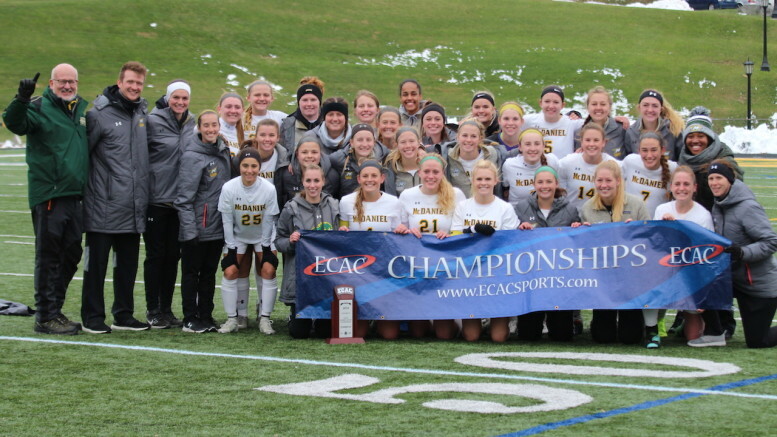 McDaniel women’s soccer won the Eastern College Athletic Conference Division III Championship after defeating Albright 3-2 at Gill Stadium on Sunday afternoon. Bringing home championship hardware came on the heels of a dominant season from the Green Terror. After Sunday’s win, the team concludes the season with a record of 14-5-1. Senior forward Kirsten Gibson led the Green Terror in scoring. The first goal came at the 28-minute mark, giving McDaniel the lead. Albright responded with a goal of their own minutes later from forward Lauren Haley, tying up the contest. Both sides would remain tied until later in the second half with Albright forward’s Diza Hasanaj putting Albright up 2-1. Minutes later, the Green Terror’s Maddie Schwartz, a sophomore midfielder, responded with a headed goal from senior Alyssa Johnston’s corner kick. With the game time ticking away, both sides pursued the game-winning goal, but the Green Terror ultimately secured it. Gibson rebounded one of her own shots on goal and slid it by Albright goalkeeper Alexis Tunney in the final minutes of competition. 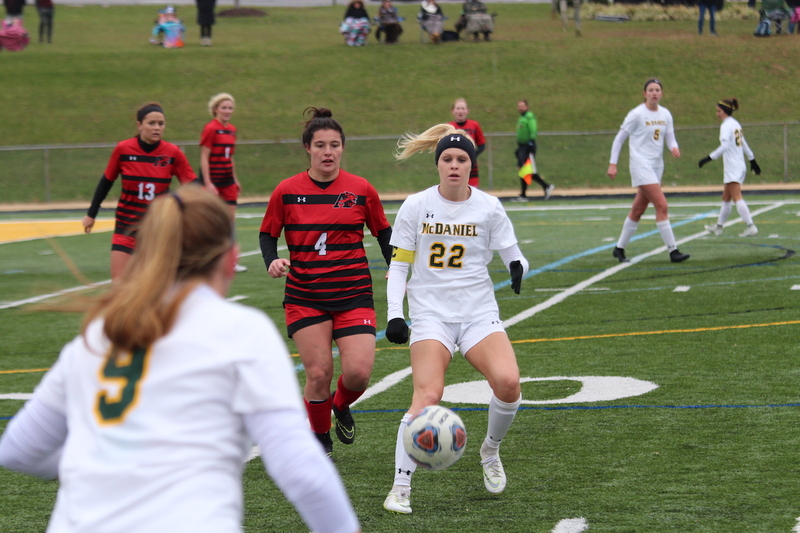 Gibson’s two goals led McDaniel to victory. It was an ideal way for the senior to conclude her soccer career on the Hill, said the forward. 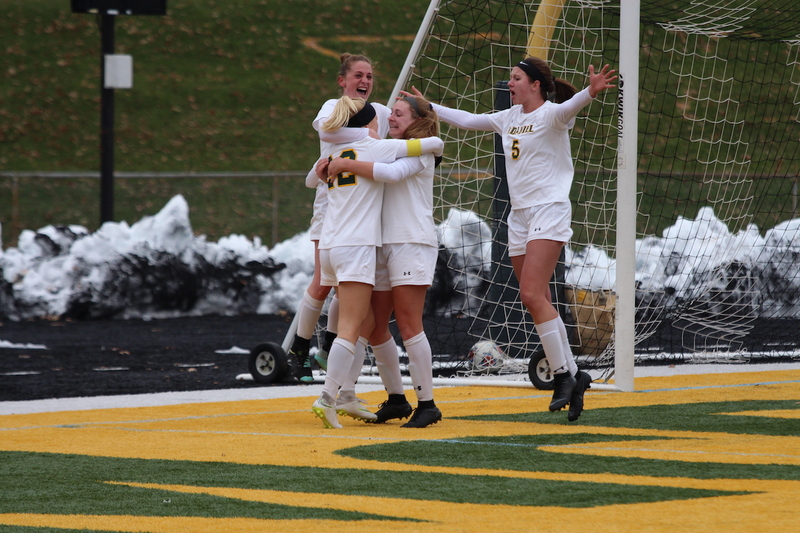 Despite cold weather conditions, the McDaniel community rallied around the women’s soccer team to support them during competition and celebrate the victory. Along with the ECAC trophy does come the end of college playing careers not only for Gibson and Johnston, but seniors Jo Rice, Marissa Funke, Annie Marshall, Rachel Engle, and Lindsey Farrell. Being a champion is rooted in the work and dedication before the big win, and this rings true for the women’s soccer team. Taking on the title of ECAC champions is a culmination of talent, effort, work ethic, and teamwork for the Green Terror. The team’s potential was even recognized as early as last season. Having the support from the McDaniel College community throughout the entire season further shows how much of an impact the community really has on the Hill.